The impact site of the Apollo 16 mission's S-IVB rocket stage, which slammed into the lunar surface in April 1972. A sharp-eyed NASA spacecraft has spotted the final resting place of part of one of the rockets that took astronauts to the moon, more than 43 years after the booster slammed into the lunar surface. The space agency's Lunar Reconnaissance Orbiter (LRO) has finally found the crater created by the impact of the Apollo 16 mission's S-IVB rocket stage back in April 1972, NASA officials announced last month. The S-IVB was the third stage of NASA's huge Saturn V rocket, which blasted the Apollo astronauts to the moon. Beginning with the Apollo 13 mission in 1970, S-IVBs were sent to impact the lunar surface. Earlier Apollo missions had placed seismometers on the moon, allowing scientists to study the object's interior structure when the leftover rocket stages hit. The S-IVBs' impact sites were estimated from old tracking data. 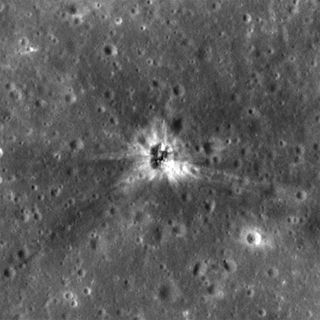 LRO, which has been circling the moon since 2009, had previously found the spots where the booster stages used with the Apollo 13, 14, 15 and 17 missions had landed. But nobody was quite sure where Apollo 16's S-IVB fell, because contact with the stage was lost for a short time when it was on its way down. As it happened, the actual impact site was off by about 19 miles (30 km) from the place where tracking systems of the day predicted it would be, LROC team members said. Two images showing the impact site of the Apollo 16 mission's S-IVB rocket stage, which hit the lunar surface in April 1972. Each image shows a swathe of the moon 1,300 feet (400 meters) wide; north is up. Craters caused by S-IVB crashes are much shallower than the holes gouged out by asteroids and comets. "The craters from the booster impacts are unusual because they are formed by very low-density projectiles traveling at relatively low velocity (2.6 km per second; 5,800 mph)," LROC team members wrote in a description of the Apollo 16 S-IVB discovery images. "The S-IVB booster can be imagined as an empty soda can hitting the surface — just an outer metal shell with very little interior mass (all of the fuel was used to send the astronauts toward the moon and the tanks were empty)," they added. "During the impact, much of the energy went into crushing the booster, and only a shallow crater was formed."